Snowstorms have historically plagued many states, notoriously those located in the Northeast and Midwest. Winter storms occur all over the country, but the "snowbelt," stretching across the Great Lakes from Minnesota to Maine, receives the brunt of winter storms. Just as the first settlers on New England's shores struggled to survive the brutal snowstorms, so do the inhabitants of today's metropolises. Cities such as Buffalo, New York City, Milwaukee, and Detroit experience snowfalls that strand residents in knee-deep or hip-deep snow. Officially, the National Weather Service defines a blizzard as large amounts of falling or blowing snow with winds in excess of 56 kilometers (35 miles) per hour and visibility of less than 0.40 kilometers (0.25 miles) for more than three hours. German settlers in Iowa originally coined the word blizzard, coming from the word blitzartig, meaning "lightning-like." European pioneers and settlers were astounded by the severity of the winters. Although accustomed to snow in their home countries, they were newly confronted with driving winds and freezing weather characteristic of snowbelt regions. Early East Coast settlements were battered by a series of harsh winters. Not only was the snowfall deep, but the weather was extremely cold, often freezing the bay around Boston and rivers to the south as well. However, most travel was by foot, so many of the early storm fatalities occurred offshore, when coastal ships were caught in winter gales. Perhaps the most pressing problems for new settlers entailed shortages of wood and coal for heating homes. During winter, horse-drawn carts and wagons were fitted with runners that could glide over the snow. This photograph was taken in New York City during the Great Blizzard of March 12, 1888. As towns grew and people established routes for travel and postal service, several storms in the early 1700s rendered the roads impassable and hindered communications. A storm in 1717 dumped about a meter (3 to 4 feet) of snow, which in some places drifted to 7.6 meters (25 feet). The journey from New York to Boston was almost impossible; the single successful post runner abandoned horseback for snowshoes. 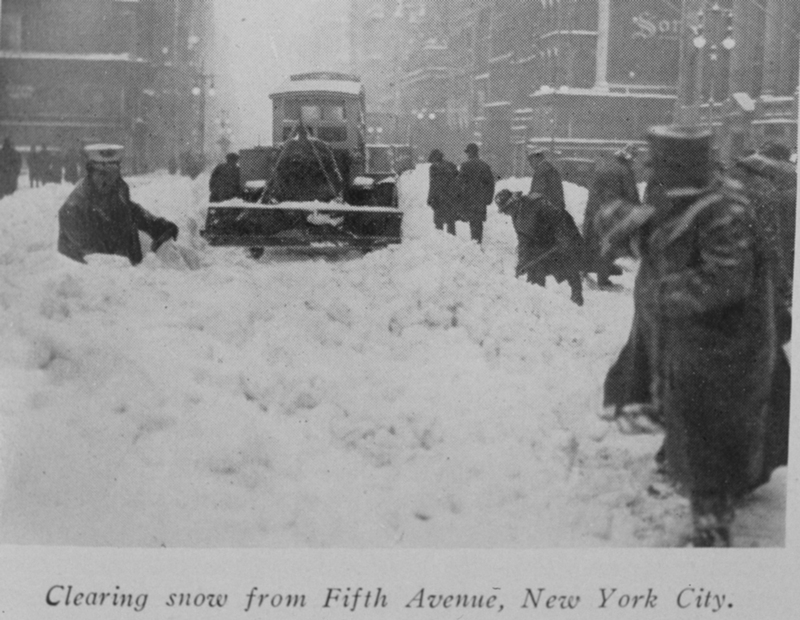 For more than one hundred years, this storm was known as "The Great Snow." Other, less severe, snowstorms followed over the years, accompanied by the usual winter hardships. In 1741, a severe and very cold snowstorm froze waterways and harbors, curtailing shipments along the East Coast for more than a month. Although severe weather hindered commerce, residents learned from their experiences. City residents began stockpiling firewood and other supplies in advance of winter. For those who could not afford enough wood or coal to warm their homes through the winters, charities often came to their aid. To improve travel in wintertime, horse carts and coaches were installed with ski-like runners, which were better able to handle snowy conditions than wheels. Of course, parties of revelers often took advantage of the snowy roads and ice-covered rivers, which proved excellent for sleigh rides. Weather watchers in rural areas and cities kept wary eyes on temperature and air pressure, and provided a climatological record as well as weather diaries for future reference. Beginning in the 1820s, they sent records to the Smithsonian Institution where the various reports were collected in an attempt to analyze and forecast weather. Reports were also relayed to the public through newspapers and telegraph dispatches. As populations grew and commerce expanded, wintertime blizzards began to present more critical problems to city dwellers who relied on frequent deliveries of food and supplies. In severe winters, intercity roads and railways were often blocked for weeks at a time. Ice-jammed waterways prohibited coastal shipments as well. Fire hazards became a worsening problem, due not only to increased congestion of stoves and fireplaces, but also due sometimes to the extremely low temperatures that froze water in the tanks and hoses of the firefighting equipment. Early attempts at snow control simply involved citizens going into the streets to level the drifts for sleigh traffic. Ordinances in many cities required homeowners to clear their sidewalks of snow, but snow removal was not yet practiced on a citywide basis. In order for residents to travel by carriage, or for merchants to receive goods or customers, they were responsible for clearing their own streets. They frequently hired snow shovelers to do this for them. As a result, wintertime travel in the early 1800s was still mostly by foot. After heavy snowfalls, shovelers were hired to clear the streets. Here, shovelers in New York City remove snow after a blizzard in 1926. As the 1800s progressed, new buildings and new technologies were put to the test by severe winter storms. Heavy, wet snow collapsed roofs and suspension bridges. Gale-force winds mangled telegraph and electrical lines and downed poles, increasing the threat of electrocution and electrically-sparked fires. Cities like Milwaukee, Chicago, and New York enacted new codes to ensure that buildings could withstand the combined forces of snow and wind. Public officials and residents alike called for putting existing and future telegraph wires underground to avoid further safety hazards. Enterprising inventors were issued the first patents for snowplows in the 1840s, but several years passed before the plow designs were put to use. One of the first mentions of snowplow use comes from Milwaukee in 1862. 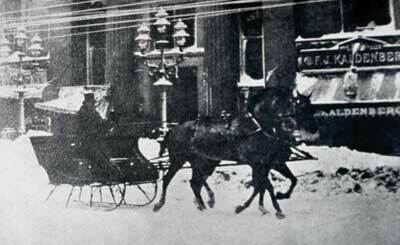 The plow was attached to a cart pulled by a team of horses through the snow-clogged streets. Over the next several years, horse-drawn plows gained popularity and came into use in many other Northeastern cities. Intercity steam trains, having made their appearance several years earlier, began to puff and whistle their way through heavy drifts with giant plows attached to their front ends. Salt was used in a few cities, but residents strongly protested salting because it ruined the streets for sleighing and damaged pedestrian's shoes and clothing. However, the invention of the snowplow initiated widespread snow removal efforts in cities and also created a basis for municipal responsibility in snow removal. 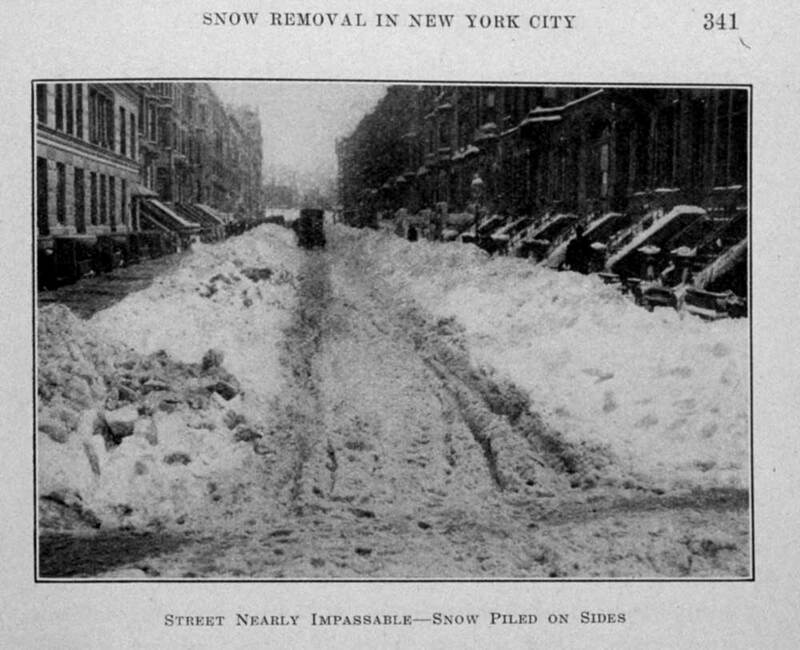 Piles of snow render New York City streets nearly impassible in this photograph from 1915. Even after shovelers and snowplows cleared streets, cities were faced with a new problem: how to clear the resulting piles of snow. Even today, after particularly heavy snowfalls, cities still struggle to clear the mounds of snow left behind by plows. Plows were a boon to city dwellers, enabling winter transportation to recover more rapidly from storms than in previous years. However, plowing created a new round of problems, some of which remain with us today. Plowing cleared the main streets for traffic, but effectively blocked the side roads and sidewalks with huge, uneven mounds of compacted snow. Businessmen and townsfolk initially hailed the success of the plow, but later complained and even brought lawsuits against the plowing companies. Merchants claimed that their storefronts were completely blocked by mounds of plowed snow, making them inaccessible to their customers, and pedestrians bemoaned trying to negotiate the huge mounds, which often obstructed the sidewalks. Sleigh drivers also found fault with the plowing system because of the ruts and uneven surfaces it created. 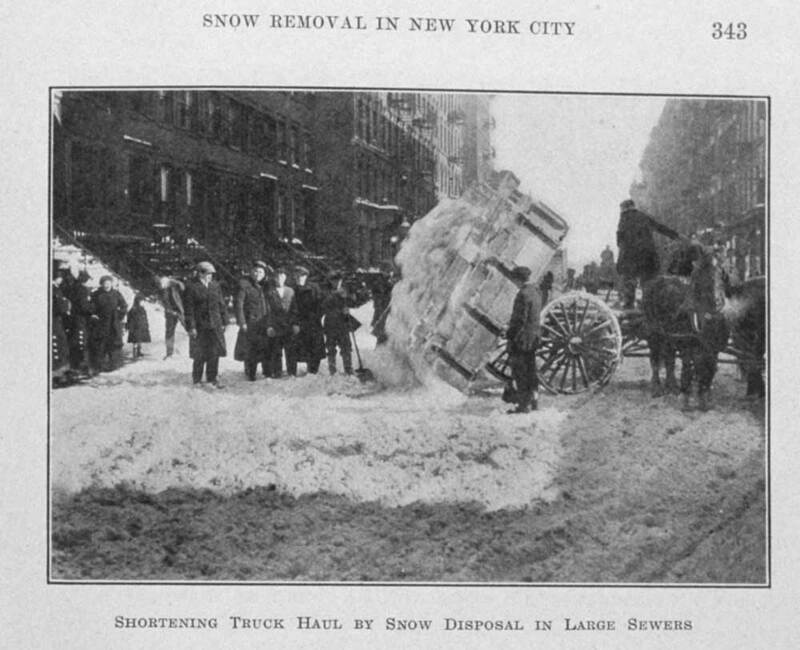 To avoid mounds of snow left behind by shoveling and plowing, cities began to load snow into carts and haul it to rivers and sometimes to sewers, where it could melt and drain away. Many cities today must still haul snow away. New York and other cities responded in several ways. They hired horse-drawn carts and shovelers to work in conjunction with the plows, hauling away the plowed snow and dumping it into rivers. This not only cleared the mounds of snow, it created thousands of temporary jobs throughout the winter season. In an effort to curtail the use of salt, which many still protested, streets and icy bridges were coated with sand instead. To appease all sides, New York in the 1880s built elevated steam railways along the major routes of the city, constructed high enough to remain unaffected by snowdrifts. Still in operation today, these elevated tracks proved very successful, and carried travelers through all but a few of the most severe storms. Prior to the invention of the subway, the elevated trains were often the only transportation available in storms that halted all ground travel. In spite of these advances in their struggle against snow, the notorious "Blizzard of 1888" paralyzed the Northeast after three days of snow, wind, and freezing weather. During the blizzard, between 0.75 and 1.25 meters (2.5 and 4 feet) of snow fell, and drifts were reported to cover entire first stories of buildings. Carts and carriages in the streets were abandoned and buried by snow as drivers realized the futility of their endeavors. Schools, city railroads, and public offices were closed, and even New York's elevated railways were victim to the mounting drifts. Passenger trains headed for New York were trapped for two days in drifts exceeding 6 meters (20 feet), and jammed the tracks for more than 1.6 kilometers (1 mile) outside of the city. More than 400 people lost their lives in this storm. This photograph shows a train collision at Coleman's Station in New York City during the Great Blizzard of 1888, which produced record snowfall for the entire New York City area. Following the 1888 blizzard, cities recognized the need for more organized snow removal and looked for ways to avoid some problems altogether. Previously, city officials often waited until storms were nearly over to begin snow removal, but they discovered that taking action during the first stages of a storm produced better results and more rapidly cleared roads. To combat the snow more effectively, cities were divided into sections and assigned to plow drivers. 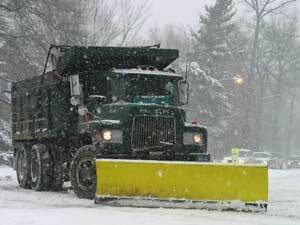 Increased numbers of plows cleared the streets with more efficiency. City officials were also more determined to bury communication wires and create alternative methods of transportation, such as trains and subways, that wouldn't be as hindered by drifting snow. Steam trains were usually effective at clearing their own tracks when equipped with plows. However, for shorter inner-city transport, cities tried electric trolleys with plows, which proved to be unsuccessful. Several northeastern cities had considered the idea of underground railways, but in the wake of the Blizzard of 1888, the idea became far more appealing. Boston installed the first stretch of subway tracks in 1899. New York followed with its own subway five years later, and both cities extended their lines significantly over time. While some of the snowiest places in the West were—and still are—in remote, relatively uninhabited places, there were incidents of travelers getting caught in winter storms, often with grim consequences. In October 1846, at the beginning of what is still considered to be a record snow season, George Donner, leading a group across the Truckee Pass, just north of Tahoe City, California, was surprised by an early winter blizzard. Within eight days, the snow had drifted 12 meters (40 feet) high, trapping the group in the mountains. They weren't rescued until April 1847, and by then only 47 of the initial 87 remained alive amid reports of cannibalism. In winter 1873, Alferd Packer and several fellow gold seekers trekked into the San Juan Mountains of southern Colorado. Trapped in severe winter weather, months later, only Packer returned. When the bodies of the remaining men were found, evidence indicated that they had been cannibalized by Packer, for which he was later tried and convicted. Cleared train tracks in the Sierra Nevada at Emigrant Gap, California, after a snowstorm in 1917. Although the sparsely populated West was not as drastically affected as the eastern metropolises, the western states received a fair share of winter storms. In the western part of the country, railroads were a critical form of transportation, especially for the mountain mining industries. Subways and elevated rails were not practical for the vast plains and mountain passes, so steam trains battled drifts with giant rotary plows, which plowed snow and blew it off the tracks at the same time. 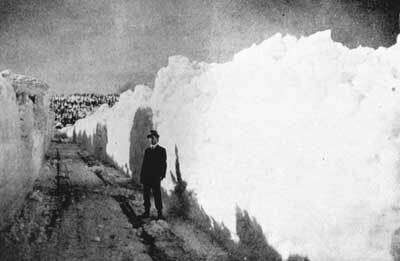 Ranchers erected snow fences, which protected roads and prevented snow from drifting too high on their property. The burgeoning population centers of the West, such as Denver, Salt Lake City, and Seattle, soon acquired snow removal equipment to battle the winter storms. However, some of the sunnier cities were often able to rely on the sun or mild weather to melt heavy snowfalls, as they still do today. Motorization swept the country in the early 20th century, leading to motorized dump trucks and plows as early as 1913. Many cities rushed to motorize their snow removal fleets, abandoning their horse-drawn carts. In conjunction with the new trucks, cities began to use tractors equipped with plow blades. To haul the snow away, they used steam shovels, cranes, and railway flatcars to get the snow off the streets and dumped into the rivers. As motor vehicles became common, cities sought faster ways to clear streets after heavy snowfalls. 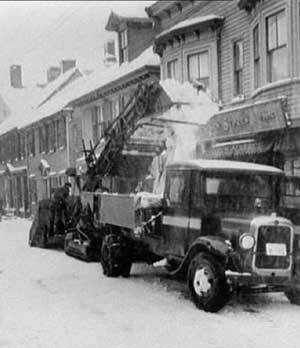 Equipment like the Barber-Green snow loader helped clear the streets of Newport, Rhode Island, in this photo from the 1930s. Another motorized invention, the snow loader, was successfully tried in Chicago in 1920, and several cities purchased snow loaders that same winter. The snow loader was an ingenious contraption. Riding on tractor treads, it was equipped with a giant scoop and a conveyor belt. As the snow was plowed, it was forced up the scoop and caught by the conveyor belt, which carried it up and away from the street. The snow was then deposited into a chute at the top where it was dropped into a dump truck parked underneath. The snow loader made snow removal much easier and more effective. Early aviation development also advanced snow removal technology. Runways needed to be kept clear, prompting the first small airports to find solutions. Salt was effective only on ice and light snowfalls, and plowing mounds of heavy snow was time consuming. To combat the snow even before it hit the ground, snow fences were constructed on the windward sides of the runways, effectively trapping snow and preventing it from blowing onto the runways. New fleets of dump trucks and tractor plows were very expensive for cities to purchase and maintain, but the amount of revenue lost if the streets were not cleared was by far more expensive than snow removal equipment. Because cities and businesses provided urban populations with a wide variety of goods and services on a daily basis, large snowfalls that debilitated transportation could strike a financial blow. The popularity of the motorcar created a whole new set of problems for snow removal crews. By 1925, more than 17 million cars were registered, vastly increasing the demand for dry, safe streets. As motorcars took to the streets in force, public safety demanded snow removal efforts even for a snowfall of less than 10 centimeters (4 inches). Due to increased dependence on the automobile, not only main thoroughfares needed clearing, but residential streets as well. Scenic snowfalls once reminiscent of winter merrymaking became unbearable, and the freezing weather once welcomed by sleigh parties create hazardous driving conditions. Automobile accidents rose due to weather-related conditions. Although some cities have dedicated snowplows, many cities also mount temporary plows onto tractors, dump trucks, and other maintenance vehicles to provide more coverage after a heavy snowfall. Slick layers of ice left behind by snowplowing renewed demands for salt and sand use. No longer concerned about protests, city officials used salt by the ton to ease road conditions and also experimented with cinders and sand. Motorized salt spreaders became the primary tool in fighting snowy roads, and businesses and private citizens as well used tons of salt to keep driveways, sidewalks, and access routes clear of snow and ice. However, several cities in the Great Lakes region were unable to use salt due to the extremely frigid weather that rendered salt almost ineffective. In addition, while salt worked well on icy roads or minimal snowfall, it did little good against deep snow. Parked and abandoned vehicles posed another problem faced by snow removal crews. Urban streets now provided parking places, which in winter months hampered snowplowing efforts. Desperately needing to clear the streets, plows ended up packing huge drifts against parked cars, forcing owners to dig them out. Realizing there was a conflict, city ordinances were created, banning overnight parking for certain city areas, or posting signs marking snowplow routes, where parking would be banned when plows were in use. Many of these ordinances are still in effect throughout major cities, increasing the efficiency and thoroughness of plowing efforts. Along highways, severe blizzards stranded motorists who often abandoned their vehicles, creating nightmares for plowing crews who tried to clear around lumps of snow-covered cars. Today, winter weather still catches commuters unprepared, and highways often still become littered with stalled and abandoned cars during blizzards. After severe blizzards, several states have required federal assistance in the form of financial aid and help from National Guard troops to clear streets and help remove cars from highways. Well after automobile use had become widespread, shopping centers, office parks, and industrial centers saw the need for private snow removal equipment of their own to clear parking lots for their employees and customers. This created a market for smaller, customized equipment, and spurred technological innovations and increasingly specialized functions. As snow removal efforts progressed, protests against salt renewed, supported both by environmentalists and motorists whose cars were being corroded by years of winter salt use. Environmental experts discovered in the late 1960s that salt use was corroding cars, damaging roadside plant life, polluting water supplies (including drinking water supplies), and killing fish in streams. Cities that continued to use salt invested in improved salt spreaders designed with more efficient spreading gauges. Snowbelt cities like Buffalo and Syracuse in New York are among the snowiest cities in the United States, but others also receive significant amounts of snowfall. Salt Lake City, Utah, Anchorage, Alaska, and Denver, Colorado, have each received 2.5 meters (8 feet) or more in their record high seasons. These record highs are for cities only; remote mountain areas and smaller towns have received higher snowfall amounts. Paradise Ranger Station in Washington State and Thompson Pass, Alaska, regularly receive more than 12.5 meters (42 feet) of snow each winter. Sites along the Rocky Mountains and Sierra Nevada Mountains also receive between 10 and 20 meters (33 to 67 feet) in a season. Many communities across the country endure blizzards or unexpectedly large amounts of snow. The following list is not meant to be comprehensive, but captures a sampling of the historic blizzards in the United States. February and March 1717: "The Great Snow of 1717" blanketed New England in a series of four storms, leaving nearly 1.25 meters (4 feet) on the ground and drifts up to 8 meters (25 feet) high. January 1772: "The Washington and Jefferson Snowstorm" is so named because it trapped both men at their homes with snow up to one meter (three feet) deep throughout Maryland and Virginia. December 1778: Named after the Revolutionary War troops stationed in Rhode Island, drifts were reported to be 4.5 meters (15 feet) high after this storm. December 1811: A powerful storm buffeted New York City, Long Island, and southern New England, accompanied by gale-force winds and destructive tides that severely damaged many ships and harbors. January 1857: "The Cold Storm" produced severe blizzard conditions along much of the eastern seaboard. Temperatures fell below nine degrees below zero Fahrenheit, and snowfalls were up to 60 centimeters (24 inches) deep. 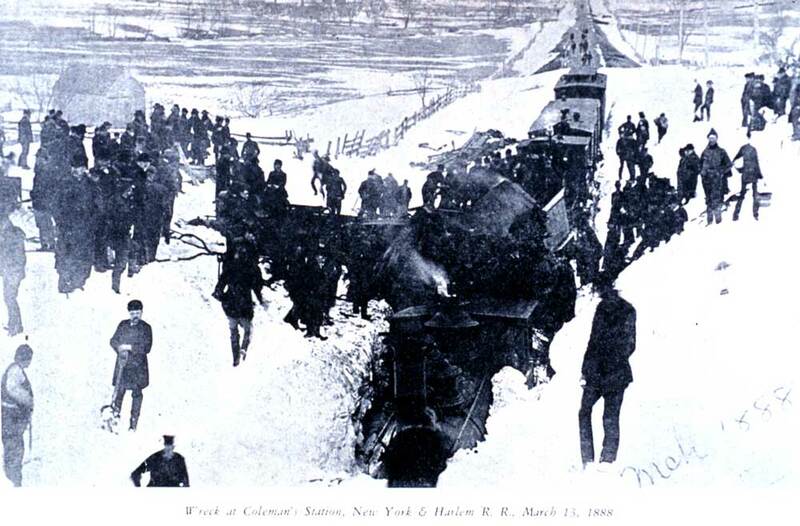 March 1888: The "Blizzard of '88" produced temperatures plummeting well below zero degrees Fahrenheit, ravaging gusts of wind and deep snow drifts that stranded several cities, leaving them without transportation or communication. New York City suffered the most damage, particularly to its harbor areas. November 1898: The "Portland Storm" was named after the ship that sank off the coast of Cape Cod, the S.S. Portland. High winds and moderately heavy snows accompanied the storm. January 1922: The "Knickerbocker Storm" dumped over 60 centimeters (24 inches) of heavy snow on Washington D.C. causing the roof of the Knickerbocker Theatre to collapse, killing nearly 100 people. December 1947: A post-Christmas storm caught New York residents by surprise, dropping more than 50 centimeters (20 inches) of snow in 24 hours. January 1967: A series of record-breaking storms battered the west coast of Lake Michigan, hitting Chicago the hardest, shutting nearly everything down. Looting of the unattended stores became rampant, and it took the city over two weeks to clear the major highways and roads. February 1969: New York City became trapped under a deep snow. Commuters became stranded in their cars, schools closed, and travelers were stuck at airports, which were also forced to close. To make matters worse, many of the snow plows had become buried by snow in their storage lots and had to be dug out before they could be used. The city and outlying suburbs were forced to hire 10,000 shovelers and workers to clear the streets. February 1977: Ontario, Canada, and western New York state were slammed by a storm that killed 28 people and shut down the city of Buffalo for more than a week. Highways were clogged with thousands of stranded vehicles, and people became trapped at schools, stores, and offices, where they were forced to spend the night because they could not make it home through the blizzard. March 1993: The "Blizzard of the Century" ravaged the southern mid-Atlantic states from Alabama to Massachusetts, accompanied in other states by severe weather disturbances such as tornadoes, thunderstorms, and floods. Many locations experienced record-breaking snowfalls and record snow depths. January 1996: The Blizzard of 1996 was responsible for over 100 deaths and brought much of the eastern United States to a complete halt. Schools, offices and airports were closed for several days in some areas as roads were impassable. Compounding problems, two subsequent storms blasted the same areas within the following week-and-a-half.